Well I bagged my leather chesterfield from the auction house on Monday eve paid Â£380 for it ( had decided my bail out price was 3K â yes I go a little crazy at auctions and anyhow Graham was with me and heâs bail out price was Â£300 and he was bidding). I had to do a lot of pocking and prodding to get him to go past the Â£300 mark â we had a full scale domestic but hey its home.Â So now I have to accessorize it and I was thinking of some patterned textiles.Â Am rather taken with tartan maybe itâs the thought of remote craggy castles,Â long country walksÂ and roaring log fires. Am imaginingÂ herringbone tweed blankets or tone or toneÂ cushions in hues of chocolate, grey or charcoal. 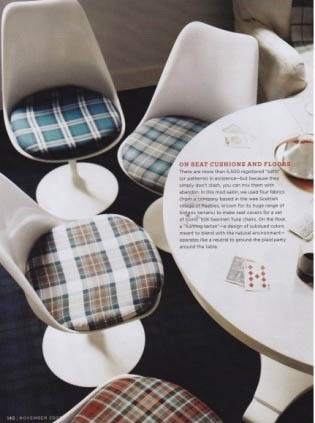 Tartan I must proclaim makes interiors wittier and wilder and that dear friends is the whole point! This image makes me want to jump onÂ a train to Scotland – its check galore but because its subtle the walls and the floors work fabulously together.